Quadricuspid aortic valve (QAV) is a rare cardiac valvular abnormality. To our knowledge, less than 200 cases have been reported in the literature till date. Most of the reported cases were diagnosed with the help of echocardiography. QAV usually presents in the fifth or sixth decade of life. In symptomatic patients aortic valve replacement remains the treatment of choice. However, extreme caution should be exercised by the surgical team as this condition is often associated with other cardiac condition including coronary artery abnormalities. We present a case of the congenital quadricuspid aortic valve with mild asymptomatic aortic regurgitation in an adult patient who presented with recurrent stroke. Figure 1. Illustration showing Hurwitz and Roberts classification of quadricuspid aortic valves [5, 6]. A 57-year-old male patient with a past medical history of hypertension, hepatitis C, sciatica status post discectomy twice, status post cervical vertebra fusion, nicotine dependence, alcohol abuse and marijuana use presented with right lower extremity weakness and fall 12 hours ago. Examination revealed left lower extremity strength of ⅘ which was his baseline strength since last stroke and right lower extremity strength of 0/5. A computed tomography (CT) scan of the head without contrast ruled out hemorrhagic stroke; old stroke of left occipital lobe was appreciated. CT scan of the spine revealed status post discectomy and fusion at C6-C7 level with disc spacers in place, cervical fixation with anterior plate and partial fusion of C3-C4-C5-C6 vertebra. Radiography of bilateral shoulder and hip did not reveal any fractures. The patient was medically managed for acute ischemic stroke. MRI spine revealed degenerative changes and foraminal stenosis at the level of L3-L4, L4-L5, L5-S1 and small disc herniation at L3-L4. Magnetic resonance imaging (MRI) of the brain revealed acute ischemic stroke in left frontal and left parietal lobe. Magnetic resonance angiogram (MRA) of the head and neck revealed diminished flow in the distal branches of his right posterior cerebellar artery, the area affected by his previous stroke. Cardiac monitoring revealed a normal sinus rhythm. 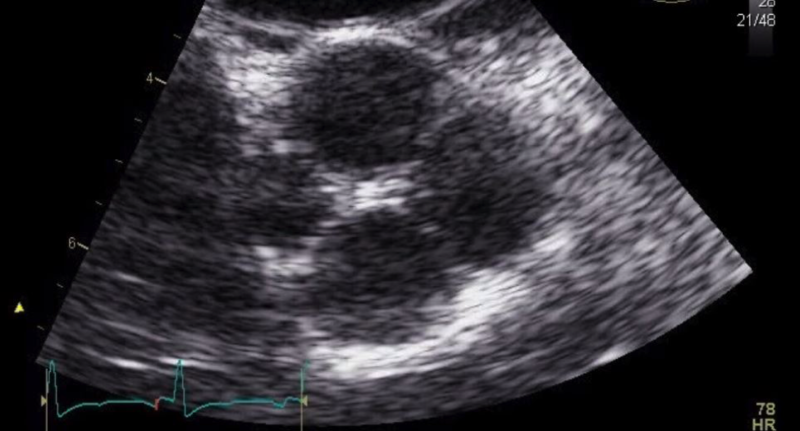 Transthoracic echo showed quadricuspid aortic valve (Figure 2), leaflets exhibited normal cuspal separation and mild aortic regurgitation. A follow-up visit of the patient revealed near total recovery of strength in right lower extremity. Patient has been advised to follow up regularly with medical doctors to monitor the quadricuspid aortic valvular function. Quadricuspid aortic valve (QAV) is a rare congenital cardiac anomaly with an incidence of 0.008 in autopsies , 0.043% as per echocardiogram  and 1% in aortic valve surgery for pure aortic insufficiency . Balington in 1862 was the first to report QAV  ; Peretz et al. were the first to describe QAV in aortography . Till date, less than 200 cases of QAV have been published. QAV is more prevalent in males, with a male to female ratio of 1.6:1 . Figure 2. Quadricuspid aortic valve (type B) as noted on the transthoracic echocardiogram (above). During the fifth week of embryogenesis, two mesenchymal ridges appear in the cephalad portion of the truncus arteriosus. These ridges fuse and descend downwards in a spiral fashion into the ventricles forming the aorticopulmonary septum. At the junction of the conus and truncus three mesenchymal swelling appear and are well developed by week six. These three mesenchymal swellings subsequently develop into three triangular aortic valves, and the process is completed by week nine of gestation . Though the exact mechanism of development of congenital QAV is not clear, a variety of mechanisms have been described. These include (i) anomalous separation of conotruncus, (ii) extraction of one of the valve cushions, (iii) an inflammatory episode that results in the separation of normal valve cushion, (iv) There is a possible association of QAV with coronary artery abnormality. Aortic valves develop just after the development of coronary arteries from sinuses of valsalva [5-9]. Pseudo-QAV may develop following infective endocarditis or rheumatic heart disease. Congenital QAV can be differentiated from pseudo-QAV by the presence of corpus arantii on each cusp [5, 10]. Table 1. Hurwitz and Roberts classification of quadricuspid aortic valves [5, 6]. Though earlier reported cases of QAV were recognized in autopsies, more than half of all reported QAV were detected by echocardiography (51%), followed by surgery (22.6%), autopsy (15.6%) and aortography (6.5%) . A transesophageal echo is superior to transthoracic echocardiography in detection of QAV. 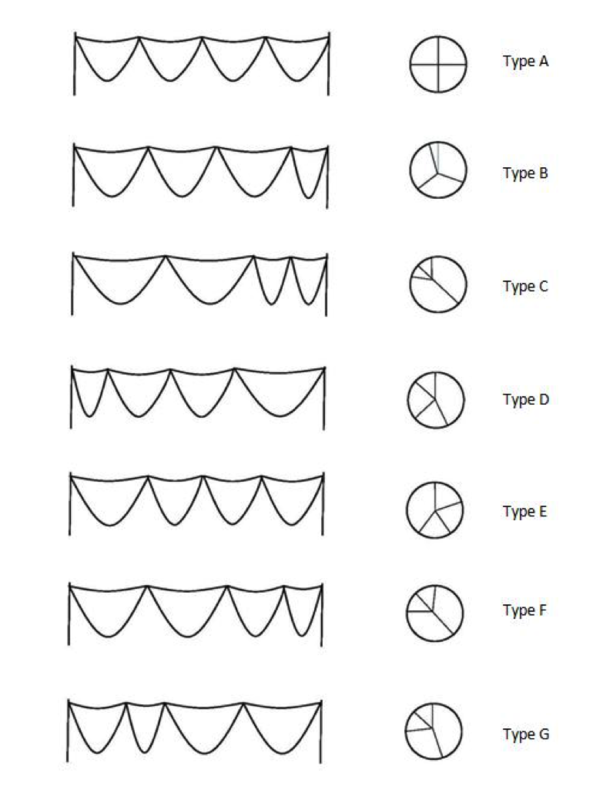 Hurwitz and Roberts described seven most common types of QAV (Table 1, Figure 1) . Fibrous thickening, unequal stress distribution and abnormal leaflet coaptation of QAV results in clinical manifestations usually later in the fifth or sixth decade of life  and the mean age at diagnosis is 49 years . Review 110 cases of QAV revealed aortic regurgitation in 64%, normal function in 24.5% and mixed valvular abnormalities 6.14% of the cases. Aortic stenosis was relatively rare and was never found as an isolated abnormality. 18% of QAV are associated with other cardiac abnormalities including supravalvular stenosis with left coronary artery atresia , ventricular septal defect , nonobstructive cardiomyopathy , Ehlers-Danlos syndrome , and pulmonary valve stenosis . Fenestrated QAV are seen in the elderly population . The risk of infective endocarditis is unclear in patients with QAV, though cases have been reported [17-19]. Infective endocarditis prophylaxis, however, is not recommended . Aortic regurgitation in patients with QAV happens later in adulthood. Through regular follow up upon detection in echocardiography is advised, guidelines on follow up are yet to be formulated. Equal sized QAV are not less susceptible for regurgitation. Aortic valve replacement remains the treatment of choice for QAV regurgitation, the first of which was performed in 1969 [6, 15]. Surgeons who operate to replace QAV should exercise caution as this condition is often associated with other cardiac abnormalities including the abnormal location of coronary artery ostia, which is at the risk of getting occluded during valve placement, especially to the left coronary ostium [6, 19]. The patient we presented has asymptomatic QAV with mild regurgitation. The QAV is of type B variety, with three equal cusps and one small cusp. We are grateful for help rendered by Pramod Srinivasa in composing the illustrations. We are grateful for editing of the article by Kamal Preet Singh, M.D. Simonds JP. Congenital malformation of aortic and pulmonary valves. American Journal of the Medical Sciences. 1923 Oct;166(4):584-95. Salvatore L, Mincione G, Baldelli P. Valvola aortica quadricuspide con insufficienza aortica. G Ital Cardiol. 1976;6:323–26. Struthers J. On the semilunar valves of the heart. Anatomical and physiological observations. Part 1. 1854.